fabulous motherhood: PlayPhonics Workshop: Basic Phonics for Beginner! 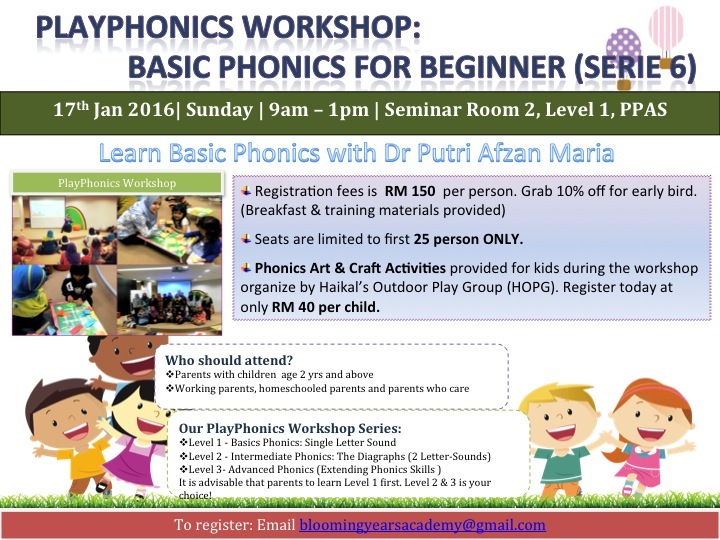 PlayPhonics Workshop: Basic Phonics for Beginner! PLAYPHONICS IS BACK and you don’t want to miss this. You asked for it and we deliver! This will be our 6th serie of PlayPhonics Workshop. Reading is an important skill that all of us want for our little darlings. Why not help them find their way to read successfully with a much more relaxing manner. In PlayPhonics Workshop you will learn what phonics is all about and how to apply it to help your early and emergent readers at home and sch. It’s really easy peasy lemon squeezy! Parents, teachers, and caring adults; MARK YOUR CALENDAR and TELL ALL YOUR FRIENDS! Venue: Training Room, Level 2, PPAS, Seksyen 13, Shah Alam . Email us at bloomingyearsacademy@gmail.com for enquiries.